Good luck is upon me…oh, how I can feel it in my intuitive bones. A much loved holiday is rapidly approaching and I couldn’t be more ecstatic for the fun-filled festivities of delicious food and…ahem, fluid. Time to dig up a dress of clover and some jewels of jade. A day of Corned Beef and Cabbage and Sheppard’s Pie galore is excitedly awaiting my hungry chops. An evening with my finest friends: Jameson, Bailey(s) and Guinness will likely be a stellar time for all. 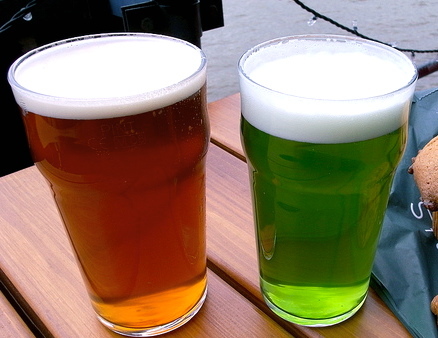 St. Patrick’s Day, you ole, good time, Irish rascal you…I’ve missed you so. Where shall we reunite? My town is no Dublin, but will have to make do. I’ve got a few solid bars up my green sleeve. Let the Leprechauns lead the way- for we only have today. 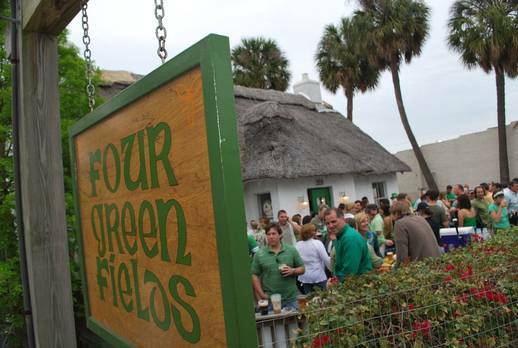 Enter Four Green Fields, an authentic and Tampa famed thatched roof tavern where only the pros are welcome. Just kidding. Wonderful Irish hospitality is evident the second one walks into this tiny cottage of good beer, good people and great food. Established in 1992, these guys made their mark when the city’s Guinness sales increased by 87% upon the pub’s opening. Better yet, an Irish publication recently named them one of the top 10 Irish pubs in the world…yes, in the whole wide world. My favorite Fare at Four Green Fields? Well, I could go on and on. The Broiled Salmon Melt simply puts salmon in a league of its own. The Sheppard’s Pie is flawless with flavorful whipped potatoes covering a delightfully moist and rich veggie and meat mixture. 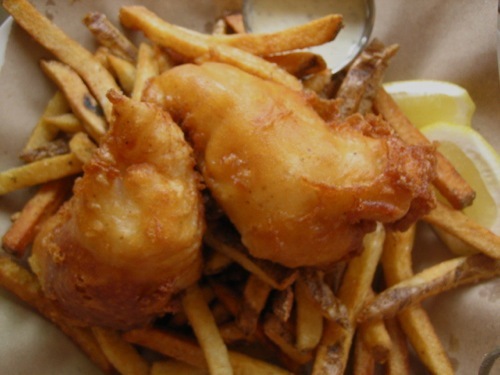 Delectable Fish n Chips…they’ve got those too. A light batter encasing fresh, mild, white filets of fish have nearly made me drool. Wet your whiskers and fill your belly when the doors open at 10am this Sunday. With a lavish Irish buffet for only $17 and live music beginning at 12PM, FGF is insisting a fantastic time, guaranteed. 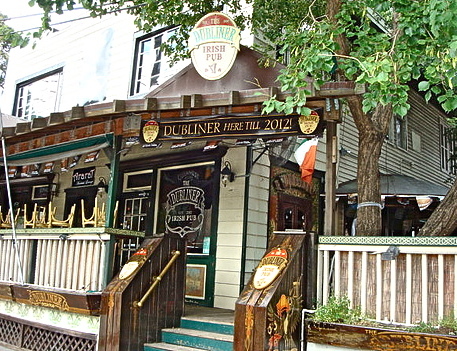 Take a stroll a couple miles south and you’ve reached Dubliner, a friendly and very lively bar I’ve grown especially fond of over the years. Probably the only drinking joint with lots of character in the overwhelmingly popular “Soho” district, they also boast some seriously awesome live music just about every night of the week. Bragging rights are understood as they have 44 beers on tap, ensuring they supply your most coveted brewskies. 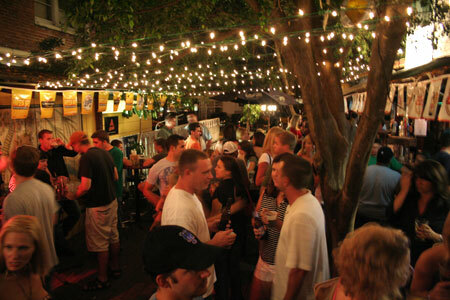 A large outdoor deck and a cozy indoor area, expect to be cramped but carefree as you sip on your yummy ale. 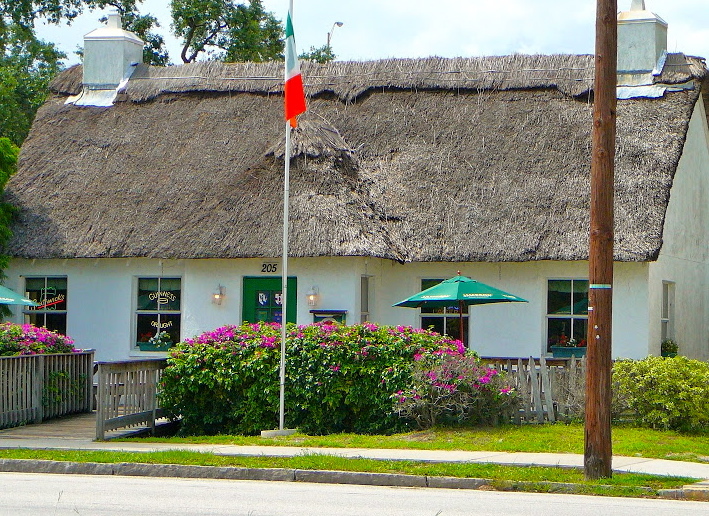 Dubliner has a strange love affair with some not-so Irish fare. Though I’ve devoured their flaky fish n chips as well as their Sheppard’s Pie…it is their pizza pie that will forever rank supreme. 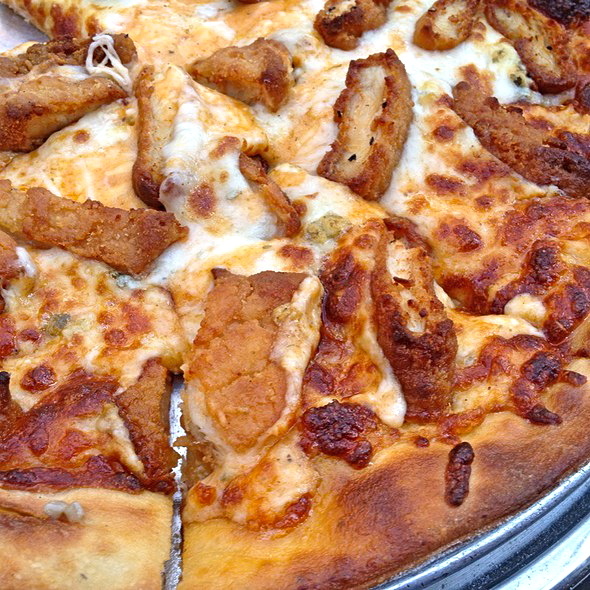 My all-time, never fails, go-to…the Buffalo Chicken Pizza. A crispy crust comes topped with mild, tangy buffalo sauce and is generously covered in mozzarella, fried chicken tender pieces and bleu cheese crumbles. It is so divine, every time. The Gorgonzola Pizza is also superb as is the fun and tasty Irish Nacho pizza. 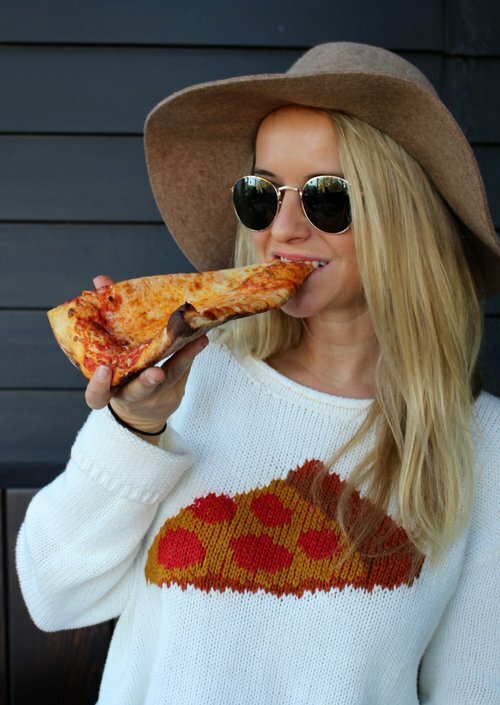 Bring on the gluttony…it is so worth it with any of the three. The good people at Dubliner are in serious holiday spirit because they offer not one, not two…but three days of St. Patrick’s Day celebrations. Appropriately called “Trinity Weekend,” the games begin on Friday with $5 Guinness’ all day long. The party continues on Saturday with an official “St. Puppies Day” including a brunch buffet from 11-3 and an outdoor festival with a dog costume competition for your added enjoyment. 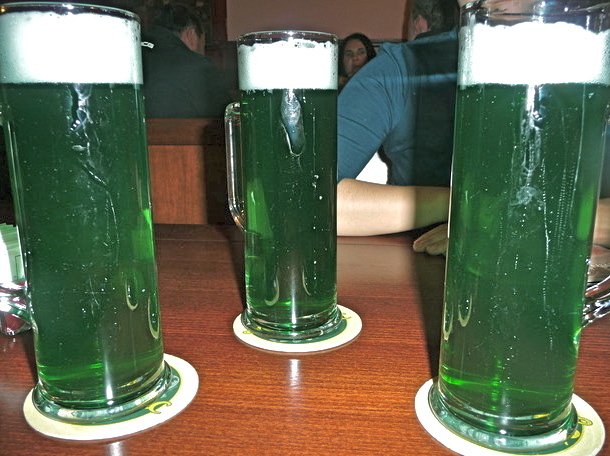 The grand finale wraps up the weekend with green beer, Irish dancers and another feast of food. Whew…now that is an Irishmen’s celebration done right. Last but certainly not least, the “oldie but goodie,” the legendary, the Irish foolproof, James Joyce Irish Pub. Technically open since 1977 but as a complete hole in the wall, these guys persevered with the famous author’s name giving them Irish superpowers. 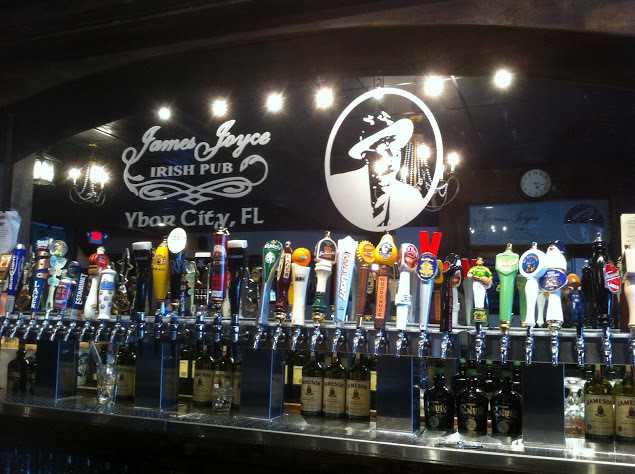 Just recently, they set up shop at a new location on 8th Ave. in the historic Ybor City. A small dark dining hall with charm, this bar is a recent favorite of mine. Fireplaces and bookshelves add some flair while their 50 beers on tap provide an endless opportunity for good tastes and good times. Live Music is no stranger to this late night spot either…weekends at James Joyce mean loud instrumental talent bursting in your ears. The cuisine is delicious. 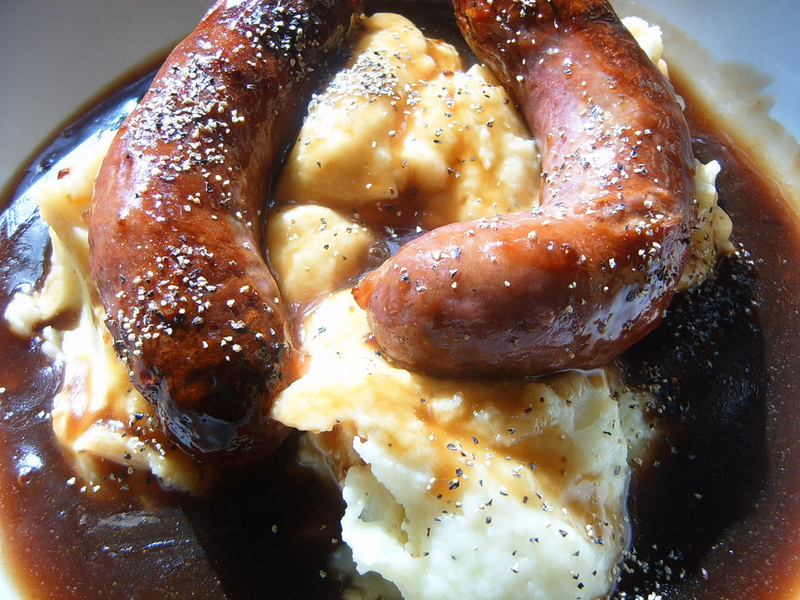 Their Bangers N Mash…the best I’ve ever had. No, I am not exaggerating. Their burgers? Large and in charge, cooked flawlessly to order and snuggled up inside of a soft pretzel bun. Oh, I must mention they have $10 Maine lobster Mondays and All you can eat crawfish boil Wednesdays. These peeps, well, they know indulgence. A massive beer tent, live music and Irish fare will exist all weekend long. Prepare yourselves for debauchery if going here…they tend to draw in the crowds on any old weekend so I can only imagine how awesomely chaotic this St. Patrick’s Day weekend will be. My Tampa leprechauns, happy and lucky you shall be. This is a weekend for food, friends and of course, good beer and Whiskey. Be fun, be safe, be lucky and most importantly, be GREEN!